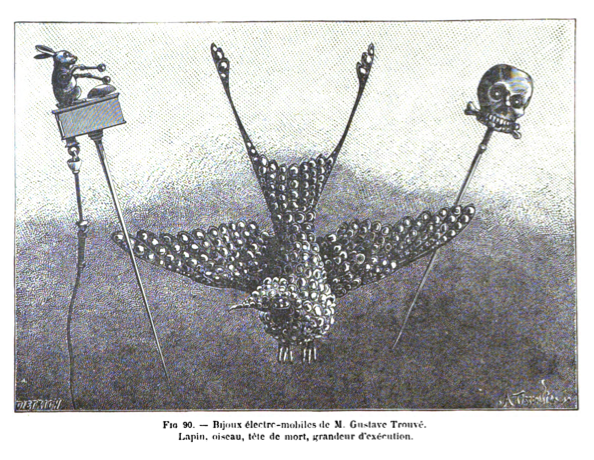 For the Kits for Cultural History project, one of the primary challenges of remaking Gustave Trouvé’s skull stick-pin (1867) is constructing the mechanism that causes the jaw and eyes to move. Specifically, the task is to settle on the most feasible design, given the technocultural context of Trouvé’s work as well as the lack of historical documentation. Since I am not an engineer, deciphering the “black box” of Trouvé’s work requires not only careful attention to the scant facts at our disposal but also consultation with people from diverse backgrounds on how they would approach the problem of remaking the stick-pin. Below, I describe the major iterations of the mechanism’s design, from its first conception through to its current manifestation, as well as how each came about through research and conversations with different people. 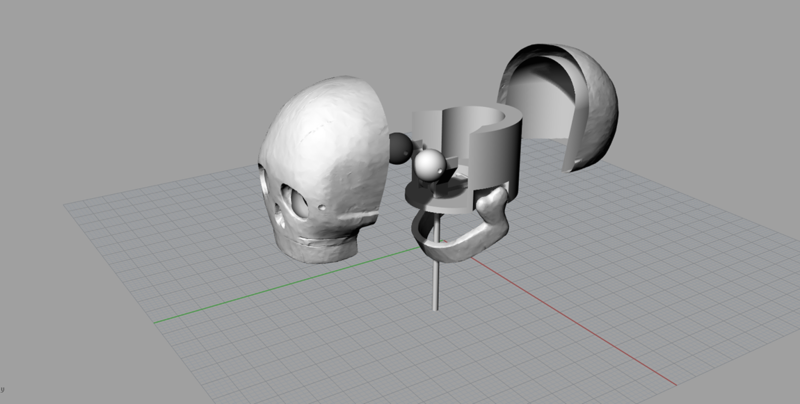 Building on Katie’s work, Nicole Clouston adapted existing designs in the MLab for use in the skull and made several geared system models using CAD software. For the purposes of historical precision, she also hand-carved a version of the skull in basswood that we then digitized using a structured-light scanner. I adapted this scanned model to make room for the interior mechanisms and later fabricated versions of it using the MLab’s 3D printer, desktop miller, and laser cutter. Once we printed a handful of gears and tried constructing the mechanism at scale, we realized our approach wasn’t going to work. Given the size of the skull (height: 9.2 cm, width: 1.5 cm, depth: 1.6 cm) on the original pin, the design required a tiny geared motor (comparable in size to the motors used to vibrate pagers or cell phones), which we do not believe was available during Trouvé’s time. We also did not have access to materials allowing us to make parts at that scale, and—perhaps most important—we also considered the assembly of the gear design too complex for the Kit‘s audiences to manage. After some more research on Trouvé’s life and works, as well as conversations with William J. Turkel, Devon Elliott, and Edward Jones-Imhotep, we shifted our attention to telegraphy, which likely inspired Trouvé’s methods. For this design, I prototyped a simple telegraph sounder and—for comparative purposes—a solenoid switch as well. The idea was that a small electromagnet could be placed inside the skull, and the jaw could act as the armature with a small hammer that, once attracted to the magnet, causes the action of the jaw to swing upwards towards the eye sockets. The added benefit of this mechanism is that the action of the magnet results in an audible “clack” sound, perfect for a teeth-gnashing motion and in many ways comparable to the sounds of a telegraph. I designed the solenoid circuit as well because it utilized the same amount of current as a telegraph sounder yet resulted in a slightly different behaviour. In the solenoid, a plunger is pulled into a magnetized shaft. With a plunger attached to the jaw, the solenoid allows for greater range of motion, meaning the jaw would be free to swing more, albeit at the cost of some of the clacking sound. At this point, we used the MLab’s laser cutter and milling machine to rapidly prototype designs across a variety of materials. For the purposes of testing, I milled most of the parts in acrylic and installed a solenoid in the skull. 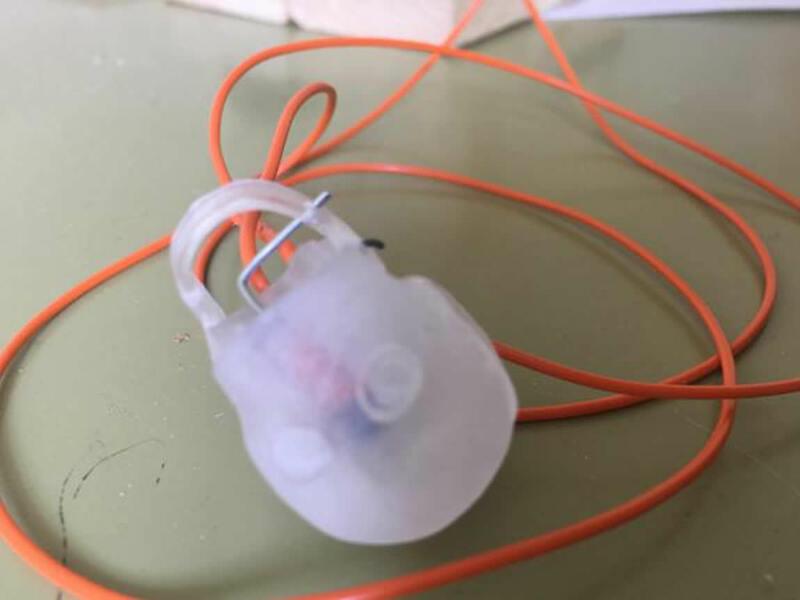 Our first working prototype was complete! While the solenoid skull worked, its mechanism was unreliable. (I credit this more to shoddy design on my part than to the feasibility of the actual mechanism.) 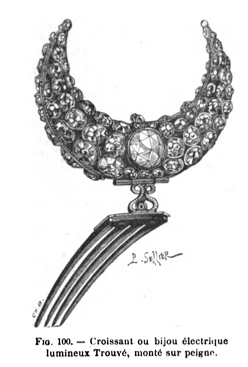 In the interests of improving the prototype, the team felt compelled to return to the diagrams of Trouvé’s electro-mobile jewelry and consider new approaches. We also contacted the Victoria and Albert Museum, whose collection includes one of the only extant electro-mobile stick-pins. The Museum kindly supplied us with additional information that allowed us to add some nuance to our approach. 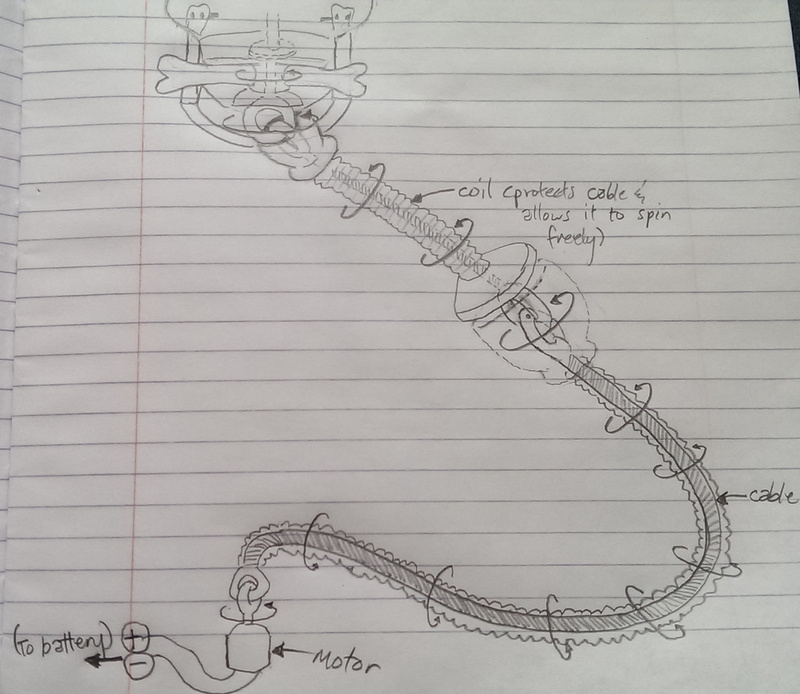 Here is a sketch of a prototype we developed after our conversations with the Museum. Animation that demonstrates the mechanism in an electric bell (image in the public domain). In this version, the armature is replaced by the jaw, with a lever attached to the hinge that also controls the movement of the eyes. As long as the lever attached to the jaw is touching the pin (which is connected to a lead on the battery), the circuit is live, causing the magnet to attract the lever, which in turn forces the jaw closed and the eyes down. This force also breaks the circuit, thereby causing the magnet to stop attracting the lever. Thus there is an oscillation between an on and off or a “jaw-up” and “jaw-down” state. 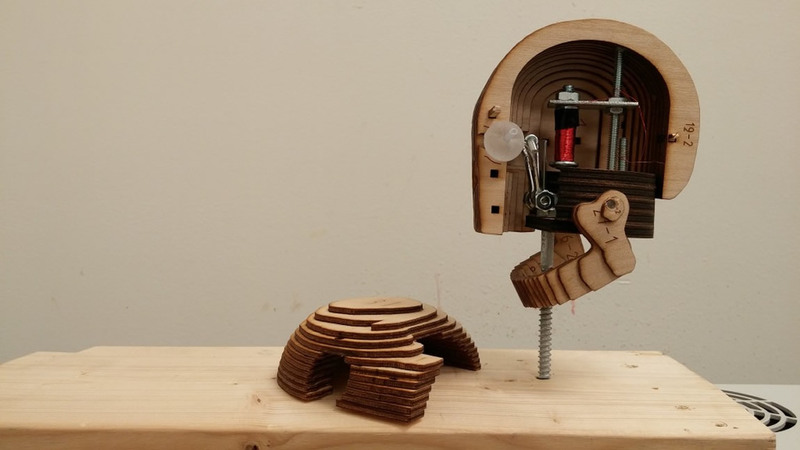 My most recent work on the skull involved making a large model of this electromagnetic mechanism and designing the lever system using CAD software. Images of both are below. While this aspect of the Kits project is not quite complete, I feel proud of how it has progressed, not only due to the various insights afforded by the designs, but also because of the methodological approaches we developed in order to speculate about the particulars of media history. The work has amounted to a close reading of technology: in the absence of first-hand knowledge, we have taken an historically informed approach to deciphering a mechanism and experimenting with versions of it. Perhaps even more important, the Kits’ collaborative research model has proven both invaluable and absolutely necessary to creating prototypes that balance technical particulars with historical, cultural, creative, and conjectural methods. Post by Shaun Macpherson, attached to the KitsForCulture project, with the fabrication and versioning tags. Images, sketches, and videos for this post care of Shaun Macpherson, Nina Belojevic, Katie McQueston, Danielle Morgan, and the Maker Lab, except where otherwise noted.